Orotava was built by Barrow Shipbuilding Co, and was launched in 1889 for the Liverpool-Valparaiso service of Pacific Steam Navigation Co. Orotava made two voyages in that service in 1889, and was then placed under Orient Line management for service from Liverpool to Australia via Suez. She made her first sailing in that service on 6 June 1890. Except for service as a troopship during the Boer War (1899-1903), Orotava remained in Orient Lines' Australia service until 1906. (The name "Orient-Pacific Line" which appears on this card was used between 1901 and 1906 to emphasize the close ties between Pacific Steam and Orient.) 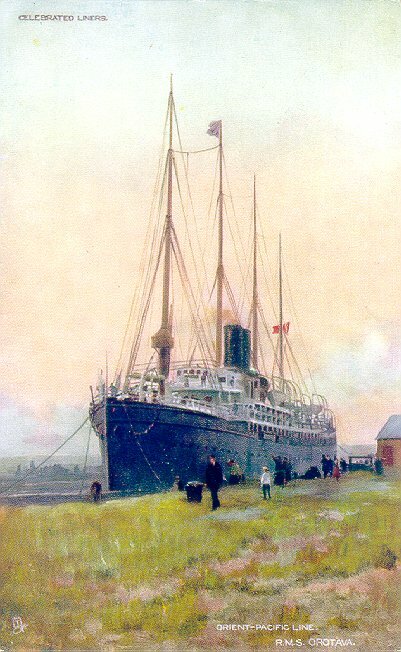 In 1906, however, Pacific Steam's Australian service was acquired by Royal Mail Steam Packet Co., which dissolved the alliance with Orient in 1909. Orotava was then placed in Royal Mail's West Indies service. After serving as an armed merchant cruiser during World War I, Orotava was broken up in 1919.